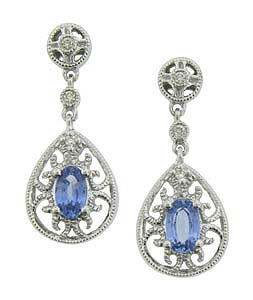 Intricate curling filigree surrounds an oval cut sapphire set into the tear shaped frame of these antique style earrings. The sparkling teardrop dangles from a diamond frosted wheel figure. Delicate milgrain decoration outlines the ornate design. These romantic earrings are fashioned of 14K white gold and set on posts. They measure 3/4" in length, 6/16" wide.